In a business often judged by endurance and performance, Cadillac has plenty of reason to celebrate. Cadillac races away the winner of the 57th running of the Rolex 24 at Daytona. One of the vehicles known affectionately as “The Dark Knight” has won the race each of the last three years. The victory is a morale booster for the brand that is currently trying to position itself as GM’s leader in EV vehicles. Cadillac has always been the brand that General Motors uses to display cutting edge technology as well as high-performance and luxury. Most recently, Cadillac unveiled its new 2020 XT6 crossover at the North American International Auto Show in Detroit. The Konica Minolta Cadillac team, led by Wayne Taylor, won the grueling race. The Whelen Engineering Cadillac team came in second. Rain caused major problems for the 24-hour race. The track was red-flagged and stopped for rain two different times. The race actually ended while the vehicles were parked during the second red flag. 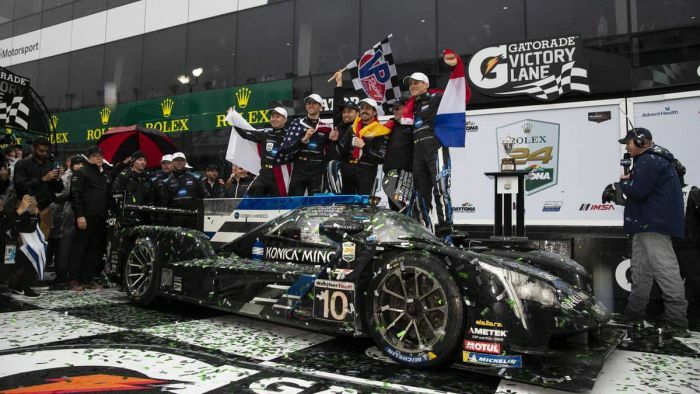 Cadillac returned to the pinnacle of prototype racing in North America after a 14-year absence back in 2017. The Dpi-V.R is intended to highlight the Cadillac V-Performance production models. The Rolex 24 is one of the first big vehicle races of the year. The NASCAR season kicks off with the Daytona 500 on February 17,2019.